It’s Not Your Grandfather’s Trainset! Meet the incredible Titan Sandwell, the creation of Derek Pratt, from Southport, England. 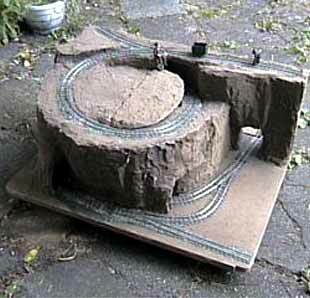 This unusual-looking layout, somewhat resembling a sand castle that has been caught in a headwind, features a continuous-run oval and a long branchline run. The branch climbs more than twice around a tight helix inside the structure to emerge at the station on top. Key elements in construction included well-aged housepaint and sand from beneath the house. You can read the whole story and see more photographs at Derek’s website. The site also pictures a number of Derek’s unique locomotive models, whose ingredients include odd bits of sheet metal, old telephone cards, Lego pieces, computer chassis cutouts, and sections of plastic toy weapons. 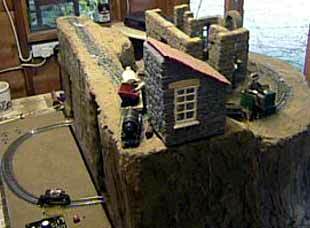 The layout is Gn15 scale (roughly 1:22.5 on 16.5mm track) and measures about 12″x16″x12″. More or less. 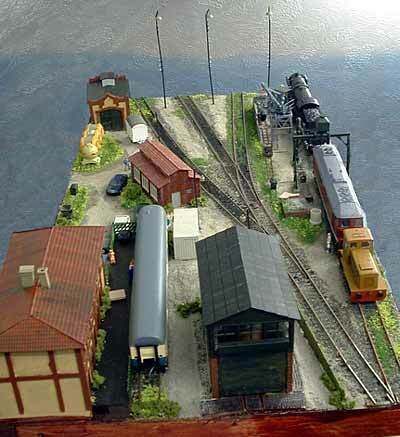 The prolific Andrew Knights, of the Wealdon Railway Group in England, has sent around photos of his latest effort, an HO scale loco depot set in Germany and featuring an Inglenook track plan. 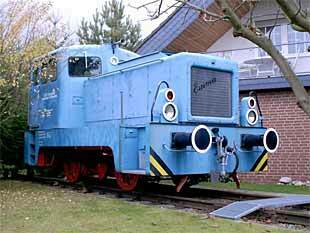 Operations, chosen by random lot, feature the switching of locomotives, rather than of railroad cars or wagons. 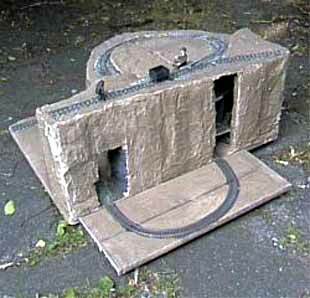 As many as eight locos can be accommodated on the layout at one time, creating some really intricate shunting puzzles! The Wealdon RG has an interesting website about their activities including contributions from Andrew. 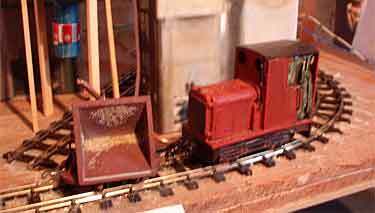 Hot on the heels of his marvelous shoebox layout, Sabot’s Wharf, Chris O’Donoghue has started construction of an even smaller working railway, Quadrant Works 1721. Total size of the layout is 17×21 cm (about 6×8 inches), and featured operation is loading the skip from an overhead bin (left above), then hauling it out to the tip at the front (right above), via a quadrant-style sector plate (shown in aerial view below). 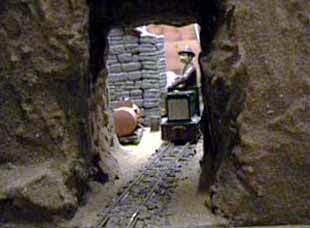 At the moment, this layout is simply a mockup, using a photographic background and a party popper for a loader (which will be replaced by a sturdier and more realistic structure!). The tipping action in front is actuated by a rising rod that enages a catch on the side of the skip. 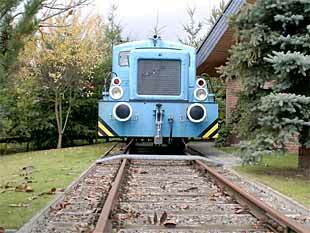 Operation is similar to the Squarefoot Estate Railway. We hope to bring you updated photos as Chris applies his specialty — making delightful buildings and scenery for these tiny OO9 layouts. Chris lives in England and is a member of the Greenwich and District NGRS.